Return to Spring Styles 1911-1925 top page. Return to Spring Styles top page. Preliminary design plan for a barge. This craft was designed to house two fully-inflated DN-1 dirigibles, but the vessel actually built was somewhat smaller, having room only for one inflated dirigible and one partly deflated. The craft, Hangar Barge # 1 (identified in 1920-21 correspondence as an unclassified district craft with file symbol YX-2), was built in 1916 but the hangar was dismantled soon after the unsuccessful DN-1 program was canceled. After several abortive schemes to alter the craft for other uses, it was disposed of by sale in 1921. This plan provides a single enclosed hangar, no self propulsion and no armament on a craft 258 feet long on the water line, 91 feet in beam, with a normal displacement (less airship cargo) of 872 tons. 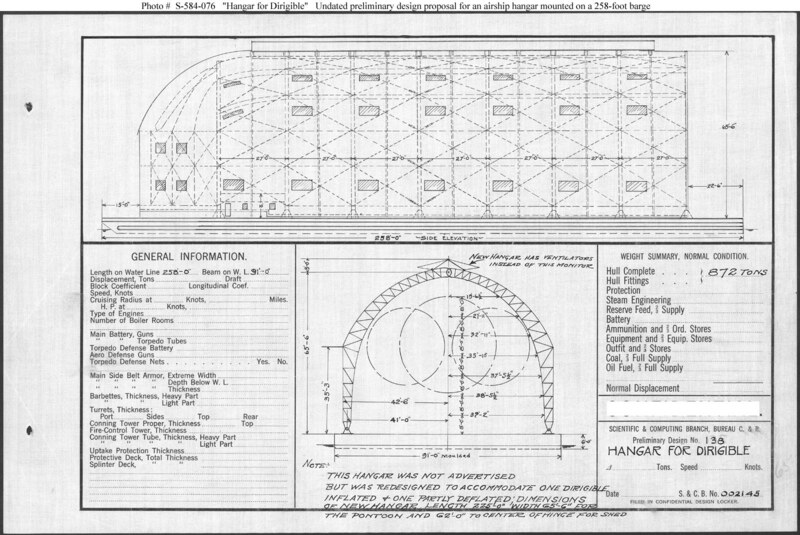 As noted on the plan, the actual craft built to this concept, Hangar Barge # 1, was smaller, 225 feet long and 65 feet 6 inches in beam. Note: The original document was ink on linen (black on white). The original plan is in the 1911-1925 "Spring Styles Book". U.S. Naval History and Heritage Command Photograph. Click on the small photograph to prompt a larger view of the same image. Return to Spring Styles 1911-1925 top page.